When OnePlus 3 was launched, everyone asked about the gold variant. Now after the launch the leaked image on Weibo says that the soft gold OnePlus 3 is going to be launched soon. All this for under $399 is a bargain and it is flying off the shelves in no time. OnePlus 3 was launched only in one variant, graphite. 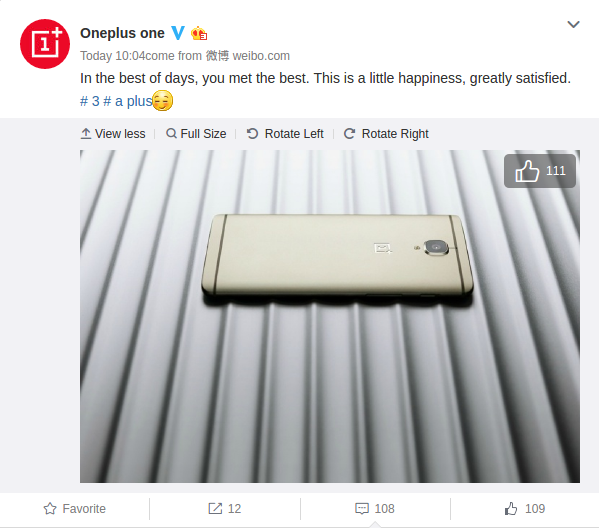 They have now posted a teaser of the OnePlus 3 Soft Gold variant on Weibo. The exact release date of the OnePlus 3 Soft Gold variant is unknown. But there was a Twitter query last month which was answered by none other than OnePlus co-founder Carl Pei, stating that the soft gold version will become a reality sometime in July. We are almost at the end of July and the sudden release of the teaser suggests that the OnePlus 3 Soft Gold variant might come out very soon. The soft gold paint job is expected to be just a cosmetic change and there won’t be any changes to the internals. But you never know what can happen with OnePlus. The teaser shows the rear side of the phone in the new color. It looks absolutely stunning and will definitely be in high demand once it comes out. Hopefully, in the near future, they might come out with even more variants of the OnePlus 3. It would be great to see a Rose Gold variant. Reports suggest that the gold colour will be launched later this month. While we await more information on the soft gold variant, the grey variant of the OnePlus 3 is doing exceptionally well globally.